Presentation coach Jerry Weissman has spent twenty years teaching CEOs and other executives how to deliver successful, profitable IPO road shows. His clients credit Jerry′s presentation coaching with helping their companies earn higher stock prices and higher IPO valuations. Weissman′s strategies have worked for dozens of big–name business leaders, including founding Yahoo! CEO Tim Koogle, Intuit founder Scott Cook, and Netflix founder and CEO Reed Hastings. Now, The Power Presenter gives you the same effective technique, style, and strategy that executive teams from more than 1,000 companies have used to raise financing, sell products, propose partnerships, or seek approval for projects. Packed with case studies of famous power presenters from Martin Luther King, Jr. to John F. Kennedy, from Ronald Reagan to Barack Obama this book shows you how to deliver a winning speech or presentation that will engage your audience from beginning to end. You′ll follow a seven–step plan for crafting your content into a compelling story. You′ll learn how to conquer your fear of public speaking and present with force and conviction, naturally. You′ll also learn how to speak with your body language, create empathy with your audience, and integrate your graphics design and animation with your delivery. PREFACE: The Wrong Way and the Right Way to Coach Presentations. INTRODUCTION: How Speaking Style and Delivery Can Raise the Value of an IPO. CHAPTER 1: Your Actions Speak Louder than Your Words. Case Studies: Ronald Reagan; Dr. Sacks′ Aphasic Patients; Nikita Khrushchev; Marcel Marceau. CHAPTER 2: The Crucial Task: Creating Audience Empathy. Case Studies: The Deer in the Headlights Revisited; Shocking British Couples; Italian Laboratory Monkeys; Robert Krulwich; Bob Dole; Gray Davis versus Arnold Schwarzenegger; Barack Obama. CHAPTER 3: The Butterflies in Your Stomach. CHAPTER 4: How to Prepare Your Content. Case Studies: Will Poole and Jeff Raikes, Microsoft; Patrick McGovern, IDG. 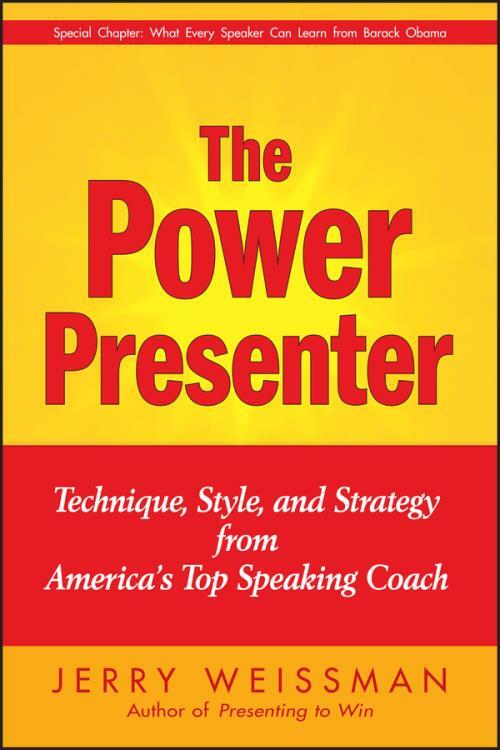 CHAPTER 5: You Can Be a Power Presenter Charisma Not Required. Case Studies: The Transformations of George W. Bush and Bill Clinton. CHAPTER 6: The Mental Method of Presenting: Make the Butterflies Fly in Formation. Case Studies: The Actors Studio; Barack Obama versus Hillary Rodham Clinton; Libby Dole; Carly Simon; Marya McCabe, Microsoft; Lawrence Steinman, MD; The Squinting Woman. CHAPTER 7: Learn to Speak with Your Body Language. Case Studies: Joe Moglia, TD Ameritrade; Marshall Klaus, MD; Sir Isaac Newton; Generals Richard Neal and H. Norman Schwarzkopf; The Kennedy–Nixon Debate. CHAPTER 8: Control Your Cadence. Case Studies: The Frenchman Who Paused; Jazz Artists Frank Sinatra, Ella Fitzgerald, Amanda Carr, and Dizzy Gillespie; General Israel Putnam; Ludwig van Beethoven; Dr. Krzysztof Izdebski and Claude Steinberg, Pacific Voice and Speech Foundation; Leonard Bernstein; Lorin Maazel; The Further Transformation of George W. Bush. CHAPTER 9: Masters of the Game. Case Studies: Sir Winston Churchill; John F. Kennedy; Reverend Martin Luther King, Jr.; Reverend Billy Graham; Ronald Reagan; Barack Obama. CHAPTER 10: What Every Speaker Can Learn from Barack Obama. Case Studies: Abraham Lincoln; John F. Kennedy; Sir Winston Churchill; Reverend Martin Luther King, Jr.; Ronald Reagan; John McCain. Case Studies: Federico Fellini; Olivier Fontana, Microsoft; Bill Jasper, Dolby Laboratories; Goldman Sachs. CHAPTER 12: Graphics and Narrative. Case Studies: Leslie Culbertson, Intel; Katherine Crothall, PhD, Animas; Eric Tardif, Piper Jaffray; Abraham Lincoln. CHAPTER 13: The Power Presentations Pyramid. Case Study: The NAFTA Debate: Al Gore vs. Ross Perot. CHAPTER 14: Coda Ending with the Beginning. Case Studies: Ronald Reagan and Joe Moglia Reprised; Cindy Burgdorf, SanDisk.